Fan Magazine Flashback is an occasional feature on how old Hollywood periodicals covered a certain movie or star. 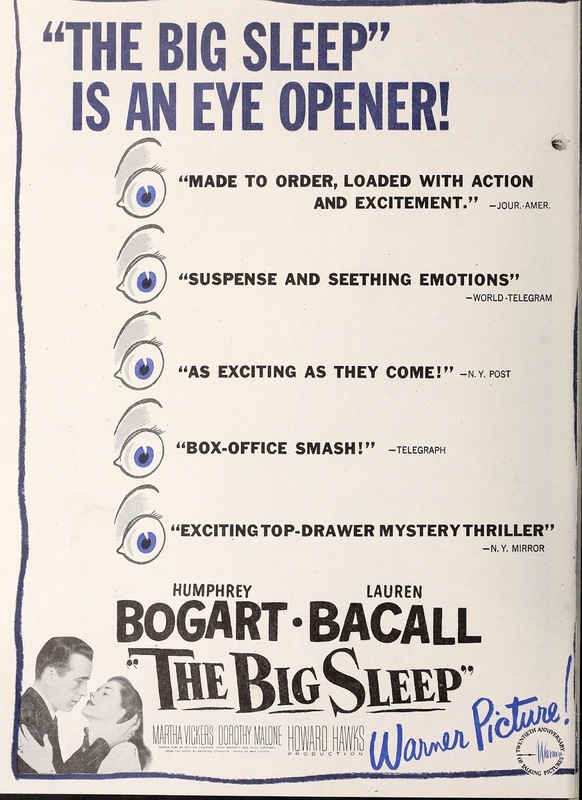 This week I'm looking at the classic film noir, The Big Sleep (1946), starring Humphrey Bogart and Lauren Bacall. This ad from Motion Picture Daily highlights the movie's good reviews. All images are courtesy of The Media History Digital Library. 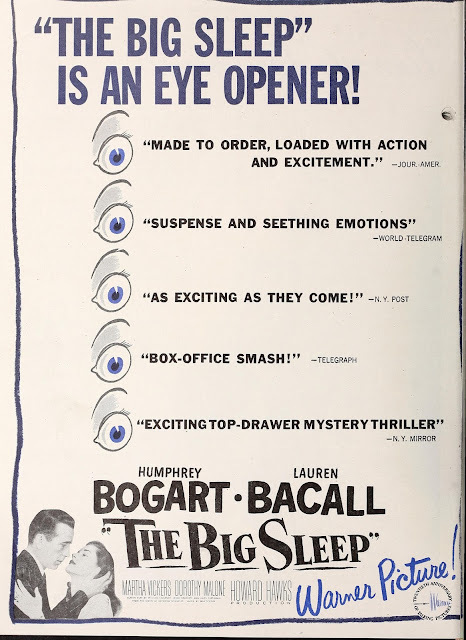 The Big Sleep was the second of four films Humphrey Bogart and Lauren Bacall made together (go here for an analysis of the movie's noir elements). The movie was released in August 1946 and most of the press surrounded newlyweds Bogart and Bacall (they married in May 1945), and Bacall's status as a late forties style icon. Note: the highlighted text will take you to a link to the original articles, although sometimes you have to turn one page to the left to see the exact article. 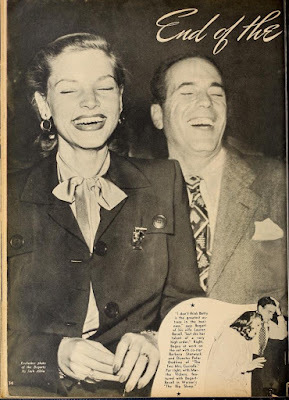 This lovely picture of the newlyweds accompanies a Screenland article, End of the Rainbow for Bogart, which has quite a few revealing quotes from the legendary tough guy. On Bacall: "I don't think Betty (Bacall's real first name) is the best actress in the business, but she has talent of a very high order." On his younger days: "I was so busy living up to the tough guy reputation I'd made in pictures that I didn't have time to arrive at a real sense of values." On expressing his political beliefs: "No one believes that actors, as a class, have extraordinarily profound minds." 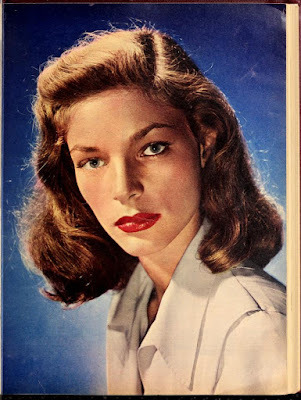 This striking portrait of Bacall accompanies a Modern Screen article, Bogey Girl. It's a gushing account of the couple's wedded bliss, complete with details about the purchase of Bogart's beloved yacht, The Santana. A sample quote that is pure romance novel: "Hi, Charlie, says Humphrey to Lauren. Or 'Butch.' Or 'Slim.' But the look in his eyes says, 'Hello, Darling.'" 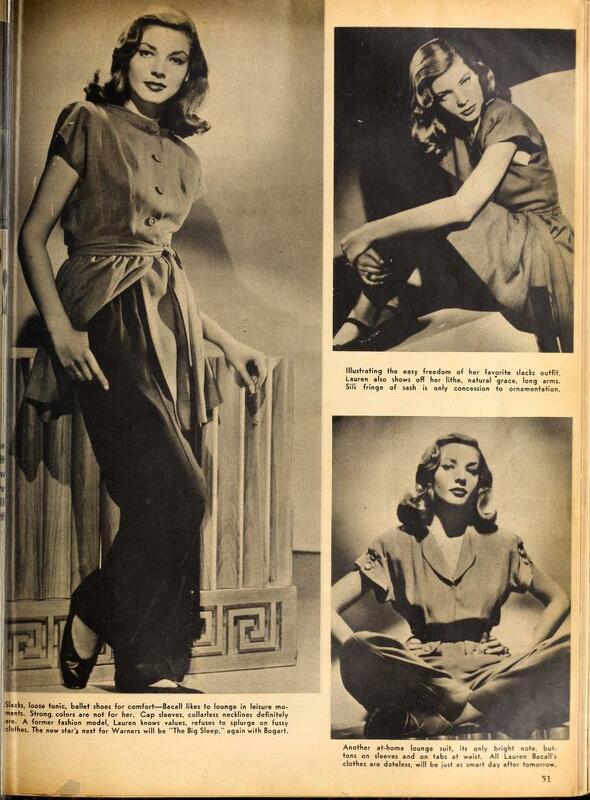 Bacall became a fashion icon soon after the release of To Have and Have Not (1944) with many young girls eagerly copying Bacall's signature style. This Screenland article, Lauren's Line, features Bacall modeling several stylish ensembles that emphasize her preference for simple, but elegant clothes.